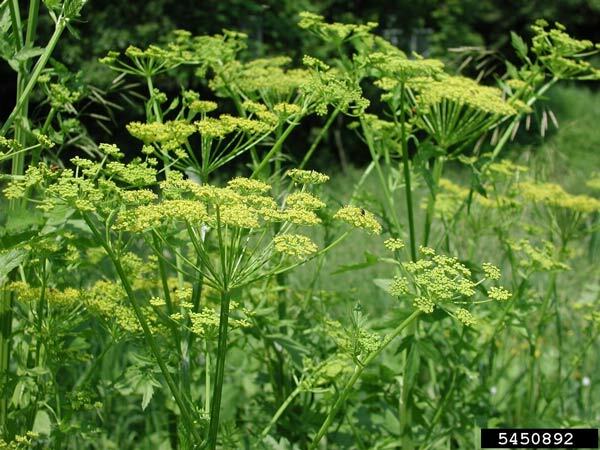 UNION, IA (WPVI) -- When you venture outside this summer, be on the lookout for Wild Parsnip. The poisonous weed which grows in nearly all 50 states, including Pennsylvania, New Jersey, and Delaware, causes burning and itching sensations. Large patches of wild parsnip, also called poison parsnip, can be found in road ditches, fields, along bike trails and in prairie areas. In a short amount of time, it can take over an area and crowd out the native plants. Wendy Prusha spotted the weed while cleaning up the creek outside her Union, Iowa home two weeks ago, pulling orange ditch lilies for a front porch decoration. "I just got down, and I was digging them and got down to the roots," Prusha told KCCI. What seemed like a harmless gardening task suddenly turned into a trip to the emergency room. "It's a constant burning (feeling)," Prusha said. "It just bubbled up overnight. The oils sit on your skin. It eats away your skin." The damage left blistered and cracked red skin on her forearm. Effects can last for weeks and scars can last for years. Chemicals in the juice of the poison parsnip react with sunlight and cause a breakdown of cells and tissues.